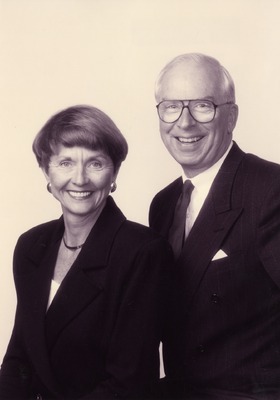 Photograph featuring Ellen & John Buchanan, long time major contributors to the Iowa City Public Library. In 1993, their pledge of a deferred gift of $525,000 was used as a challenge grant to help kickoff the"Funding the Future" campaign. Iowa City Public Library, “Donors to ICPL: The Buchanans,” Iowa City Public Library, accessed April 24, 2019, http://history.icpl.org/items/show/2725.